New Years is almost here, it’s the time to reconnect and have new goals, so where to spend New Years Eve is very important. It’s a funny thing how your priority changes by the years. When I was single with no kids, it was all about the party and waiting for the sunrise by the beach. Later on as a mom, it’s all about being with my daughters; there is no place I want to be on New Years Eve but with them. For this reason, I don’t usually go out, I want a safe environment for them, and that safe environment is home (because I didn’t know any better). This year I learned about this hot spot to ring in the New Year, called Knott’s Berry Farm. It’s not that I didn’t know that Knott’s Berry Farm existed, lol, I do, but I didn’t know that Knott’s is the place to ring in 2015 with a night full of special family-friendly experiences including live musical acts, exclusive stage shows, and Merry Farm entertainment, culminating in a fantastic fireworks show. As the final moments of 2014 count down, the Knott’s Sky Cabin will dramatically rise over 200 ft. to the top of the “K” tower as special lighting effects countdown to midnight. When the cabin reaches the top at the stroke of midnight the “K” tower, the skies above Knott’s will light up with a spectacular fireworks show! Now this is cool and my daughters are more excited about New Year’s Eve than Christmas. Who doesn’t like to be backstage? /A quien no le gusta estar tras bastidores? Who doesn’t like to be backstage? I certainly do, specially when it comes to be closest to one of my favorite animals “Horses” in one of my favorite shows in Los Angeles “Medieval times” Dinner and tournament, you can read all about why I love it so much in my previous post here . So when I got the invitation to be backstage before the show and be with the famous Pure Spanish horses, or PRE (Pura Raza Española), and the handsome knights before the night’s performance at Medieval Times tournament where all the magic happens-I was -of course- super excited. I also had my medieval moment with a tall and handsome (you know, you know) Knight, and he taught me some moves, medieval style which was super fun. Medieval times is a super fun place for the whole family, specially for girls, the little ones really enjoy to dress up as a princess or just wear a beautiful crown. If you want to learn more about Medieval Times click here. Read moreWho doesn’t like to be backstage? /A quien no le gusta estar tras bastidores? About the Minion Mayhem: it’s a super cute 3D ride with movie-based motion stimulator the way only Universal Studios can do it. I really love how only after a few months of my last visit to the park, everything was so different and made me and my family have a totally new experience, after you come out of the ride, your kids can enjoy a multi-level water play area with a spinning Dumbo-style Silly Swirly Fun Ride. The mini-land next to the Despicable Me building adds a scream-filled soundscape and dynamic energy throughout the ride-in-a-box park. With its stylized mountain peaks and colorful backdrop beyond an inviting entry arch, Super Silly Fun Land offers a rare location in the park where visitors step into a themed outdoor space rather than simply walking past it. You can find more pictures about Universal Studio Hollywood HERE from my last visit. Let’s Chat!!!... Have you being to Universal Studios Lately, and did you like the Minion ride? Or maybe you want to talk about my outfit or hair…I love to read your comments. Winter WonderLand in LA "CHILL" / Diversion Invernal en LA "CHILL"
In Southern California we have one of the best weather conditions in the United States! However, during the last few days, the Angelinos are suffering for an “extreme” cold weather, yes I know what you are thinking right now:! This curly girl is totally out of her mind, but hey!!! 60 degrees Fahrenheit it is extremely cold for us. There is one place in Southern California where it will be COLD till January 5th “CHILL” at the Queen Mary in Long Beach. Ice Tubing: It’s cold. It’s fast. It stands at 2 stories tall, 100-feet long. And it’s made entirely out of ice, fun for the entire family. Chill was magical with indoors and outdoors activities, live entertainment, holiday activities. Not to mention, the Ice Kingdom and its slides, ice tubing, ice sitting, and as important, lots of good food, drinks and a magnificent view. Ticket includes all day access to the beautiful and extravagant Queen Mary. The nutcracker story inside the Ice Kingdom, all made out of ice, beautiful and brrr—cold. 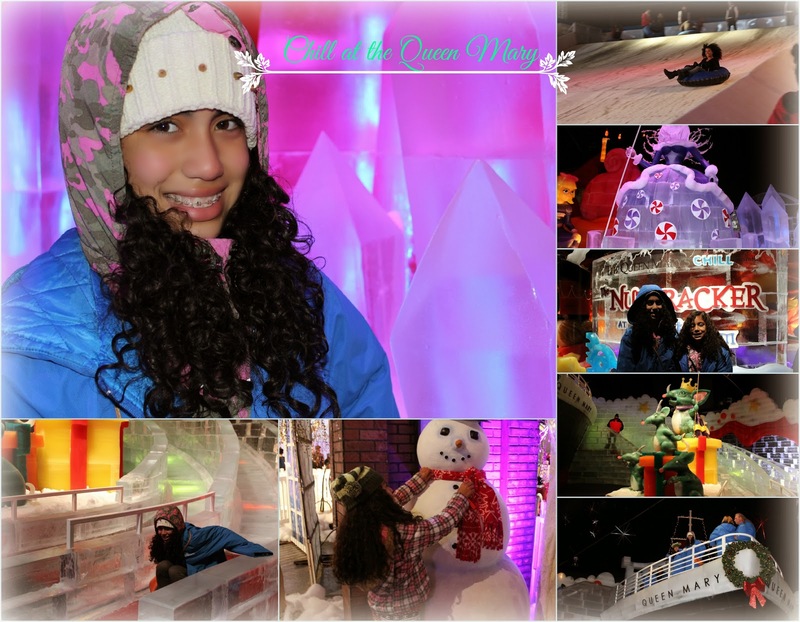 Read moreWinter WonderLand in LA "CHILL" / Diversion Invernal en LA "CHILL"